The Gospel for this Sunday presents a very extraordinary as well as dramatic and intricately woven account of the restoration of sight to a man born blind. As the narrative unfolds it becomes obvious that the seeing involved occurs on more than just one level, a level deeper than merely physical vision. After Jesus gave the light of physical sight to the man born blind, it soon becomes apparent He gave him much more than that. As a new world began to open for him, so too did a new life, a life of faith. A progression of that faith is evident as he initially referred to Jesus a man, then he called him a prophet, and finally, he bowed down to worship Him as Lord. We each receive the gift of faith in Baptism. The waters of Baptism are for us a pool of Siloam where we who are made of clay, the dust of the earth are enlightened by the infused light of grace and by it receive an eternal inheritance. How grateful are we for such a sublime gift? Are we truly appreciative of what God is doing for us? Do we pray and ever say to the Lord as did the Apostles: “Increase our faith”? Or do we give scant time to prayer and expect to remain faithful? The Golden Legend tells how St. Macarius in the fourth century, once found a skull in the desert sand. "Whose head have you been?" he asked. "A pagan's," the voice came back from the skull. "And where is thy soul?" "How deep in hell?" the saint asked. "As deeply down as the earth is lower than the heavens." "Are there,” the saint finally asked, “any souls thrust down into hell even more deeply than yours?" "Yes," the voice of the skull replied. "The souls of those who were redeemed by Jesus Christ, but held their privilege cheaply." All of us, have received a very great privilege. Through Baptism we share in the very life of Christ. We are made God's Temple and the Holy Spirit dwells within. What's more, we are nourished, even every day if we choose, with the very Body and Blood of Christ. Do not hold that privilege cheaply! We are living in turbulent, even sinister, times and many have allowed their minds to become deluded, even debased.This Gospel began with the understanding that physical blindness is not caused by sin, but it ends with the understanding that spiritual blindness, in the case of the Pharisees, is caused by sin. Remember the great dignity and the great destiny to which you are called. Reject the darkness and cling to Christ. Finally, use the time remaining in Lent to make a sincere and heartfelt Confession so that you may enjoy the light of Christ now and one day enjoy the perfect vision of Him forever in heaven. Join us for our third annual Mass Under the Lights on the Intramural fields on April 4, 2019, at 8:00 pm! This is a wonderful opportunity to evangelize and be a witness to the faith to so many athletes on campus who may have never experienced Christ! What a blessing to share our faith with so many of our peers and to give an explanation for our joy! Invite all your friends and make sure to RSVP here! Looking for a way to grow more in the faith while fostering relationships and enjoying tasty, home-cooked meals? Come on down to Supper Social, held every Thursday at the UMW CCM! 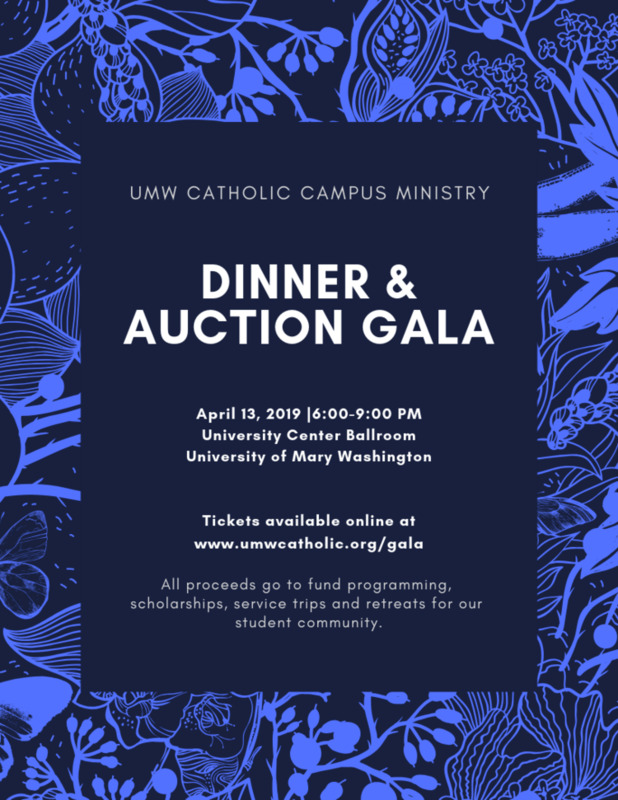 This week, April 4th, we will not be having Supper Social, but we encourage you to attend Mass Under the Lights later that evening and reception. We will be having mass on the athletic fields at 8pm to share the faith with athletes on the campus! The following week, April 11th, we will be having a Q&A style discussion by Father Vaccaro and Katrina Oteyza on Catholics and Mary. We will also be enjoying a (catered) tasty meal from Chick-fil-A with a delicious dessert made by Birthright! We look forward to welcoming you to these events! Finding that there is nothing to do around campus on Friday night! Look no further! Every week we have fun events held by our center like painting, kickball, and poker parties. Last week we had our annual Live Clue event. It was a blast. We had all the characters dressed up for the event. This week is our annual Disney/ Star Wars Night. It will be at 9 PM at the Saint John Bosco Center. We look forward to seeing everyone there! Looking to do some service for others this Lenten Season? Come out for our LAST SERVICE SATURDAY! This Saturday we will be doing garden work for St. Mary’s Parish. Meet at 9am at the center for a wonderful morning helping make our local Catholic parish look beautiful this Easter Season. We can’t wait to see you there!